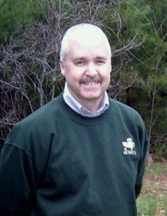 Brian Woodward wasnt green when he came to Anne Arundel County Recreation and Parks as environmental chief in 1995. He already had eight years under his belt working with Montgomery Countys parks department. But green is what he became known for in a county where greenways are scarce, despite our penetration by rivers, creeks and our meandering Chesapeake Bay shoreline. Greenways are corridors, often narrow, linking larger areas like wood, wetlands, parks and other preserved space and providing wildlife a safe passage from one spot to another. Anne Arundel County is greener today thanks to Brian Woodward, who led the effort to increase its greenways. Following stream valleys, rivers and headwaters, the greenways framework runs down the spine of the countys several peninsulas and along the shoreline of the Patuxent, which Woodward calls a forgotten river. He said that beautiful habitat, little changed by time, inspired him to preserve these natural corridors. Once the greenways are completed, wildlife movement throughout the county will be assured, he said. Greenways are so structured that no matter where humans and wildlife live, they can all get to trails or habitat. The Master Greenways Plan for Anne Arundel County calls for a network of about 71,700 acres. Currently 36,900 acres, about 51 percent of that plan, has been laid. In linking those acres, Woodward worked other stewards of county land: Chris Swarth of Jug Bay Wildlife Sanctuary; Dave Dionne, county trails superintendent; and Barbara Polito, county agriculture preservation officer. Citizen involvement is important indeed, for greenways have no direct funding. The plan has always been a voluntary plan, and we hope with education and incentives individual land owners will become a part, Woodward explained. While funding for greenways is not a factor, the current budget crunch has scuttled the position of greenways project manager. County agriculture preservation officer Barbara Polito now takes on greenways as well. A wildlife biologist by training, Woodward has always sought to teach people how to coexist with wildlife. My goal and hope was to make a difference, to contribute to something that would stand for a long time and to strengthen the credibility of the Parks Department in the environmental area so that citizens can trust what were doing, said Woodward on his last day on the job. Woodward returns to Montgomery County to take up a new challenge helping put in Smart Parks. Thats a big change, said Woodward, of his future work in management analysis. Ah, dirt, soil, decay, mold, worms and bacteria. What would life be like without them? Earth Journal begins this week in the zone of life that exists from ankle height down into the rich, lively and essential place called topsoil. Well begin with fallen leaves that, says Frost, fit the earth like a leather glove. Just below that tan-colored sheet, patterned with the forms of oak, hickory, beech, et al., the soil is dark and crumbly. Comprised of generations of fallen leaves, it is almost all organic matter. With very little clay or sand, it holds onto moisture, and it is rich in nutrients. There is lots of life in the soil, and it is life giving. It can take years to build a few inches of topsoil, on which we depend for food and forest products as we also depend on air and water. In the Smoky Mountains of the southern Appalachians are places called hardwood coves. There hardwood trees grow to monumental proportions and the forest floor is lush with a great variety of wildflowers. In them, the shape of the land allows the soil to build up deeply. Closer to home there are wooded places, where, in early spring, orchids, lilies and an impressive variety of exquisite native plants emerge. The wildflowers that display for a brief few weeks before the trees leaf out are collectively called spring ephemeras. The recent spell of cool weather may have extended their blooming period, or by the time you read this they may have faded away. After the blooms fade, in a long period called senescence, the above-ground parts break down, leaving hardly a trace. A good resource is Finding Wildflowers in the Washington-Baltimore Area by Fleming, Lobstien and Tufty. Look for yourself on Sunday, April 27, as the Maryland Native Plant Society sponsors a wildflower walk from 1 to 5pm at Flag Ponds in Calvert County. rsvp: 410.286.2928  [email protected]. 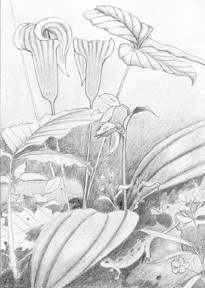 Additional trips are posted on the Maryland Native Plant Society web site: www.mdflora.org. The Vietnam Veterans Memorial in Washington, better known as The Wall, has transcended the divisions of that war by doing honor to the men and women who died fighting it. On-line, you can find the names  even the days birthdays, photos, literary remembrances. Theres a message center and a guest book. Veterans like Robert Burnett, who died of cancer resulting from exposure to Agent Orange fighting in Vietnam, is finally getting his due at The Wall. But you wont find Robert Burnetts name on The Wall, or the names of some 400 other American heroes whose later deaths were linked to wartime exposure to Agent Orange, a chemical sprayed to defoliate the forests in Vietnam and so reveal the enemy. These men and women will be honored at The Wall at a ceremony on Monday, April 21, at 10am. Some 1,000 family members, friends and fellow veterans are expected to attend the Fifth Annual In Memory Day, sponsored by the Vietnam Veterans Memorial Fund. Among them, Barbara Burnett of Calvert Homestead in rural Prince Frederick will be there in memory of her husband, Marine Corps veteran Robert Burnett, who died in 2000. When the Anne Arundel County Council approved the Annapolis Neck Small Area Plan at its March 17 meeting, two things happened. First, it formally adopted a document that aims to guide regional development for the next decade and beyond. Second, it seemingly ended a five-year process that was marked by countless meetings and endless acrimony, controversy and contentiousness. Theres just one hitch: The county doesnt know how its going to solve one of the Necks most pressing issues: where to put all the cars. As a result, the zoning statutes to put the long-deliberated plan in motion wont be finished until at least September. Of all the Necks traffic woes, none is more pressing than the choking traffic on Aris T. Allen Blvd., Forest Drive and the Riva RoadWest StreetRoute 50 intersection. All three areas are overburdened and will certainly get worse if plans to redevelop the Parole Center are carried out. But the Annapolis Neck Small Area Plans final version steers clear of the regions traffic problems and their possible solutions. Thats because no one knows exactly how bad traffic is, how much worse its going to get or what can be done about it. The most recent traffic information  a 1999 report written by URS Greiner, an independent civil engineering firm  is most notable for whats not in it  namely, feasible solutions. Planners threw up their hands at the situation in the Parole Center area, concluding that, short of a massive reconstruction, nothing could be done to improve traffic flow. As for Forest Drive, the firm could only propose widening the corridor from four lanes to eight. That may have been possible three years ago, but increased traffic plus new residential and commercial development make it unlikely today. When will the county have the information it needs? Samorajczyk says not until June at the earliest, when the State Highway Administration finishes updating its own traffic data. The county will then plug that information into its redevelopment proposal for the Parole Center and begin devising the zoning laws that will put Annapolis Neck Small Area Plan into action. Final recommendations wont come until at least September. Whats the best way to get to know your neighbors? Go visiting. Whats the surest way to start a spread-out community visiting? Neighbor Christopher Doherty thinks he knows the answer: a community-wide yard sale. Thus began the first annual Great Harwood Yard sale, scheduled for April 26. Sponsored by the Harwood Civic Association as a way of bringing the community together, the sale does double duty by pushing along many a households spring cleaning. When youre so spread out, its hard to forge a sense of community, says James Fitzpatrick, who organized the sale. His rural chunk of southern Anne Arundel County is a 950-household neighborhood with no landmarks save post office and high school. Lacking a town center, Harwood is a community best defined by its boundaries: Edgewater and Birdsville  another invisible community  to the north, and Owensville Road to the south. It gets to the Bay by embracing Cumberstone Road with one arm. With development limited to Solomons Island Road, most Harwoodians live in a rural setting and many, indeed, in the woods. Agriculture is its past, and conservation of several large farm tracts has helped preserve both rural vistas and ways. Will the first annual Great Harwood Yard Sale make friends of distant neighbors? Youll have to find that out for yourself, preferably in person. With 30 households already signed up, plenty of stops are promised on Harwoods rural roads, where youll no doubt find your share of white elephants and treasures, including a library of old sheet music. The first annual Great Harwood Yard Sale: 8am to noon Saturday, April 26, rain or shine, with brochures and maps at Southern High School and Harwood Civic Association volunteers on hand to answer questions. Information? James Fitzpatrick: 410-867-9600  [email protected]. Our Creature Feature comes from North Carolina, where research at Duke University suggests that youd better think twice before calling someone bird brained. Indeed, it turns out that in the warble and tweet of songbirds lay hidden messages that we human-brained folks are just beginning to understand. Just a few mammals  whales, dolphins and some bats  can learn to repeat new sounds, and only three categories of birds have that capacity: songbirds, hummingbirds and, of course, parrots. Songbird brains may even hold clues to how humans learn to speak and lead to new speech therapies. The belief that bird brains are primitive should be thrown out the window Duke researcher Erich Jarvis told the Dallas Morning News. © COPYRIGHT 2003 by New Bay Enterprises, Inc. All rights reserved.